Recently we had the privilege of an invite to Zenzero Restaurant & Wine Bar at St Mary’s Residence KL for a wine pairing dinner featuring Italian wines from Antinori Winery, hosted by Mr Guido Vannucchi from Antinori itself. As with most wineries, Antinori is steeped in history, being in production for over 6 centuries and family ran for 26 generations. The winery sits in the Tuscany and the Umbria region of Italy, home of many great Italian wines. Like gladiators of the past, 6 Antinori champions were presented to us for our palates' entertainment, accompanied by an exclusive Italian food pairing menu curated by Zenzero. We started with a bubbly, the Antinori Montenisa Franciacorta Brut. Fruity and dry, it is said that it could rival a respectable bottle of champagne. 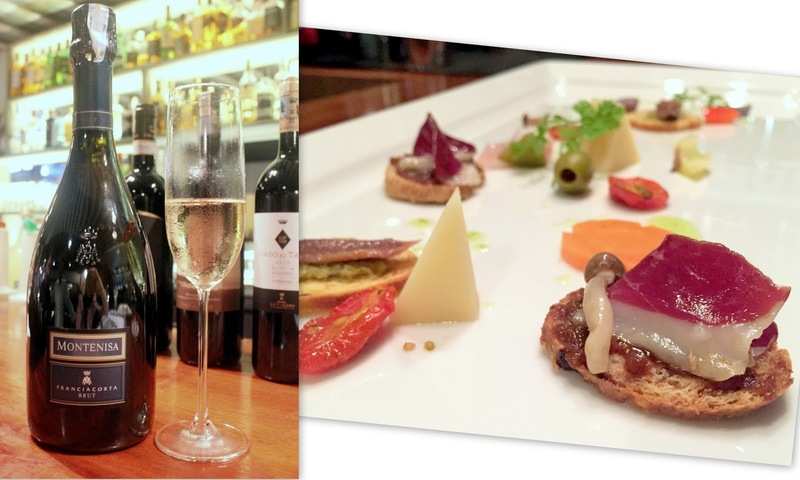 Paired with a delightful assaggini of canapes, it sure whetted our appetite for more. 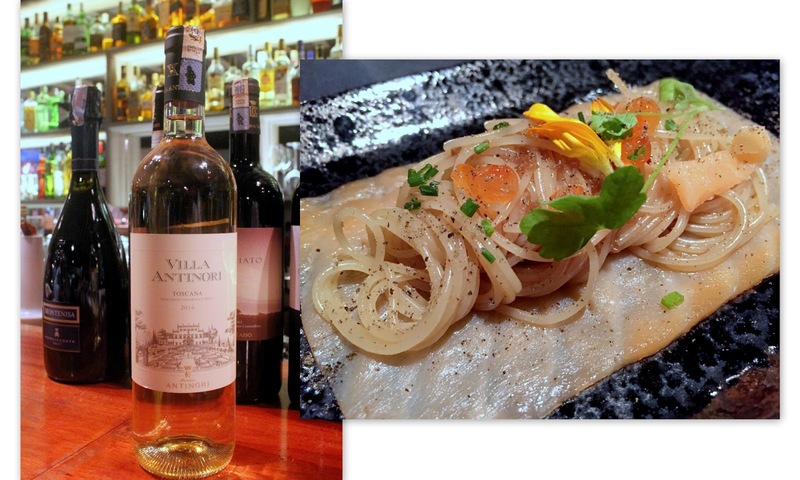 Next came Villa Antinori Bianco 2014 paired with an amuse bouche of cold angel hair pasta with smoked salmon and salmon roe which was a joy in every bite. Guido mentioned that this would be considered an entry-level wine. Fresh and crispy, it was super easy drinking. It's a bottle one could introduce to first-time wine drinkers. This is not one meant for keeping, but to be consumed young to retain its crispness. 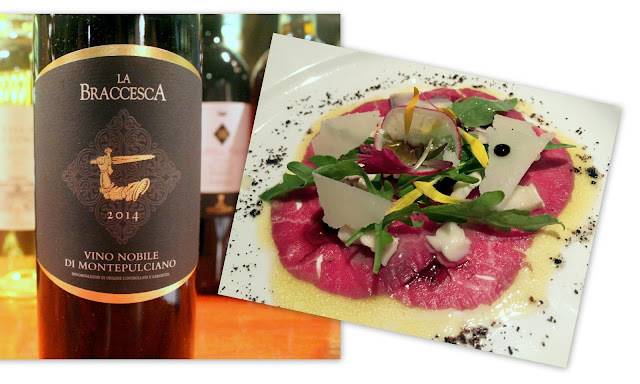 Moving on to something heavier, we had the La Braccesca Vino Nobile di Montepulciano 2014 with the Black Angus Carpaccio "Quattro Formaggi" which did not disappoint. The darker berries and some spiciness begs for food in your mouth. When paired with the paper thin slices of black angus carpaccio dressed in aged balsamic vinegar and 4 different cheeses comprising of Gorgonzola, Fontina, Grana Padano, and Goat cheeses, it was a sweet marriage. 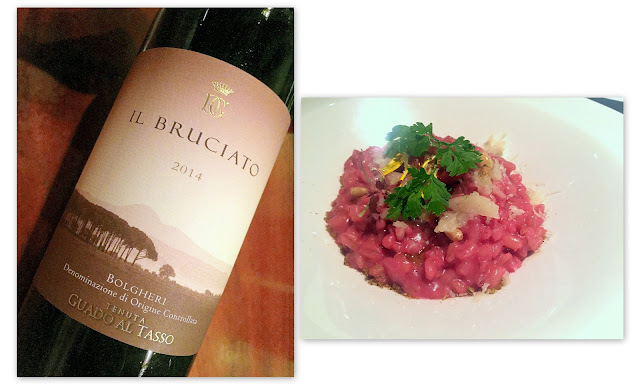 The Il Bruciato 2014 vintage came next paired with Pearl Barley Risotto in drunken cheese and pine nuts. Now for those of us expecting ‘rice’, the barley in place of actual risotto was rather interesting as the barley was more chewy than your typical grain. The woody, fruity finish from the wine was light enough to match with this risotto. 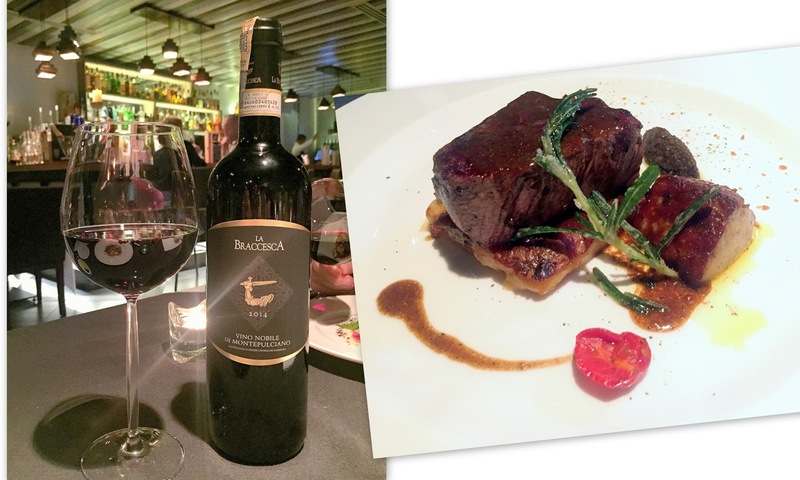 The main course of Black Angus Tenderloin & Foie Gras was paired with Guado al Tasso 2012. What makes this wine special is that the harvesting and selection of the grapes of the wine is exclusively done by hand, then after being aged in a year in French oak barrels, only the finest batches are chosen to be blended again for another 6 months in oak. The legs on this went on forever and what caught me by surprise was the curry leaves scent I got on the nose. The dish itself was easily the highlight of the night as the steak was done well (never well done, please!) and the foie gras perfectly creamy. Our group pretty much savoured this in silence, with an occasional ooh or aahs punctuating the air when a bite or sip was taken. 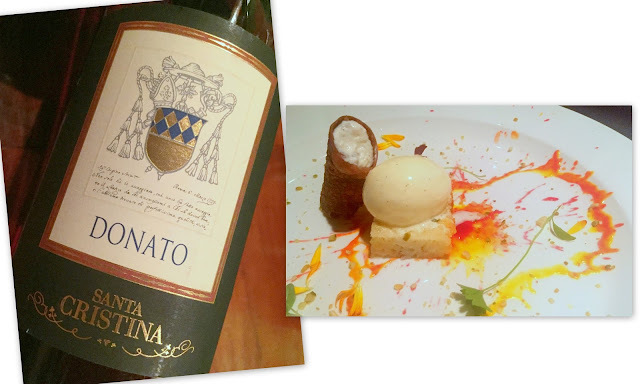 Lastly for dessert, a sweet wine, Vino Liquoroso Santa Cristina Donato degli Antinori, was paired with a Lemon and Thyme cake and Cannoli alla Siciliana, which was so cheerful it looked the sun had sneezed its rays on the plate, thanks to the melted candy (I think) garnish. For someone who has a fondness for old world wines, these Italian wines was right up my alley. If we had to choose our winner tonight it had to be the complex and bold Guado al Tasso 2012. Of course, having it paired with what was our favourite dish of the night might have helped skewed my bias towards it. Mr Guido shared with us his belief that wine is pleasure. Well, this session was definitely more than a pleasure. Thank you all for having us. Salute!